Forward by Stewart Edward White. A brief note in the Introduction states the Hawaiian sport of surf-board riding can here be enjoyed as nowhere else outside the Islands. THE very complete and able exposition by Miss Ward explains better than I could do it myself why we have come to Carpinteria. Nowhere in my experience, do mountain, sea, marshland and shore offer quite the combination they do here. The three-mile stretch of beach is in most places three or four hundred feet wide at low tide. 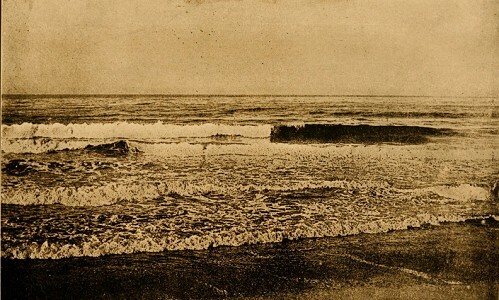 At high tide, the breaking power of the wide flat and the half-mile bar outside pile up a truly imposing surf, even at times when the Santa Barbara beach is washed by the merest ripple. As a consequence, the bathing is most safe and at the same time most exciting. The Hawaiian sport of surf-board riding can here be enjoyed as nowhere else outside the Islands. 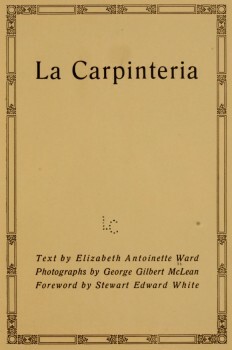 Geoff Cater (2017) : Ward and White : Carpinteria, 1910.